One of the many tricky things to negotiate when you’ve got young children is the best way to ferry them around quickly and efficiently, to keep pace with their (and your) busy lives. It’s crucial to find a reliable car brand that recognises how important space and efficiency are to parents looking for a family car. The fantastic new car deals from Honda UK demonstrate that they do just that – and take the stress out of finding a new vehicle to serve the kids’ every whim! The new Civic Diesel, for example, is a sporty-looking but also a spacious car, which means it’s practical for family use and will also look great on the road. There are plenty of high-quality models to choose from – visit their site to see the full range. 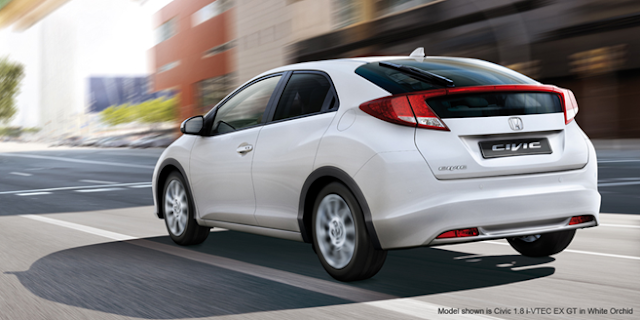 Once you’ve snapped up your sleek new motor, you’ll want to make sure you get the best use out of it. It can often be financially impractical to go abroad for your annual family holiday, and there are so many fantastic places to visit right on the doorstep in the UK. Buying a new car is a great excuse to get the family on the road discovering the magic of the English countryside. The Lake District is arguably one of the most beautiful places in England, and makes for very idyllic driving scenery. The World of Beatrix Potter in Windermere is an absolutely perfect attraction for kids – it brings to life these favourite childhood books in a fun and interactive way. The pretty tea-room is a particular highlight, especially for parents! … Or Drive to France! If you want to take your new Honda car a bit further afield, a great option is to take it to France on the ferry from Dover to Calais. Once there, you could have a leisurely drive down the country to the sun-soaked South – the perfect way to escape the endless rain at home. Montpellier Zoo makes a lovely free family day out, and will give your kids the chance to see lots of exciting animals that they might only have seen in books or on TV – lions, cheetahs and rhinos to name but a few. Or, of course, you could stay in Northern France and sample the cultural and culinary delights of the capital, Paris, and give the kids a chance to go up the iconic Eiffel Tower. The Honda will come in useful for cruising down the Champs Elysees! Stunningly beautiful video of a full moon and silhouettes. 17 amazing before and after airbrushed celebrities - and even the magnificent Beyonce isn't immune to a bit of the old airbrush. If you haven't seen it already, this Oscar nominated Disney cartoon is completely charming. 14 wonderful words with no English equivalent. The difference between an L and an R.
First world problems read by third world people. Proof that dogs understand EVERY WORD you say. And do I really need to explain this one? You're welcome. Win a copy of Skyfall! 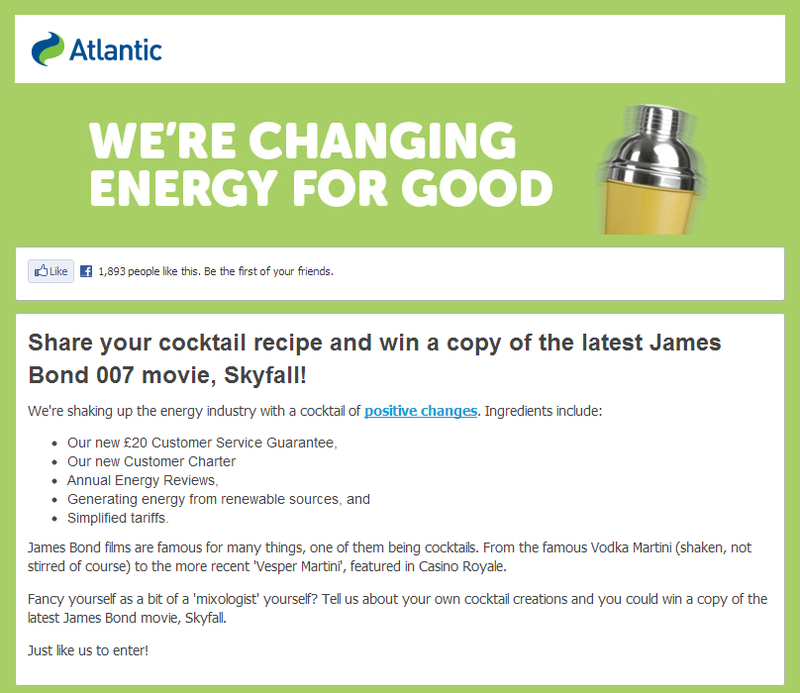 Atlantic (a part of the SSE Group) is shaking up the energy industry with positive changes! I really like their Customer Service Guarantee, something other companies would do well to follow; Atlantic were also the first energy company to simplify their tariffs; and they are leading the way in finding energy from renewable sources. 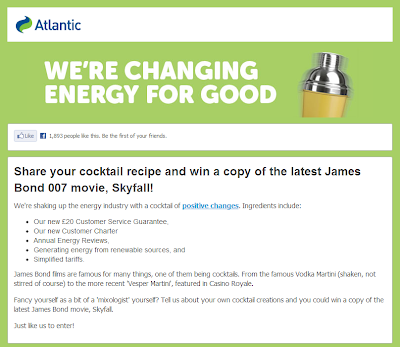 And to celebrate their positive changes, Atlantic are giving Facebook followers the chance to win the latest James Bond 007 movie Skyfall. All you need to do to enter is like their Facebook page and tell them about your favourite Bond-style cocktail recipe for a chance to win. Easy peasy. If you haven't seen Skyfall it's a great film - I took my girls to see it and we all loved it. I'm a big fan of Javier Bardem and his character, Raoul Silva, has got to be one of the greatest Bond villains of all time. So, in honour of his character I've created a cocktail (non-alcoholic of course!) called the Silva: Mix 2 shots of pineapple juice, orange juice and lemon juice in a shaker, add ice, soda water and a dash of grenadine to give it a lovely berry colour. Garnish with a cherry. Boom! If you want to enter, you need to hurry because the competition will end at 10pm on Friday 22 February - that's tomorrow folks! - with the winner being informed on Monday 25 February 2013. Go to the Atlantic facebook page and add your cocktail recipe to be in with a chance! Good luck. In the 1800s, when cameras where still a new invention, taking a photograph wasn't a quick affair. Each photograph required a long exposure which meant the subject had to stand perfectly still for that time. If they moved, the photo would be blurred. 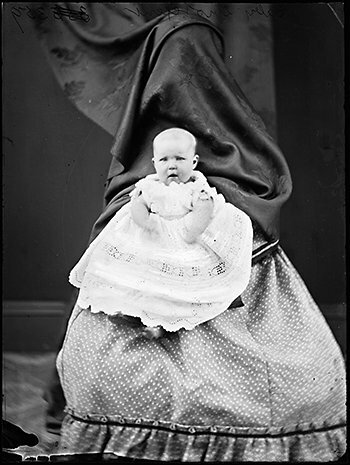 When it came to taking photographs of small children a cunning, but slightly creepy, method of keeping the child in place was adopted. It was the 'hidden mother', although in the photo above she's not so much hidden as covered up with an old curtain. A blind man on a galloping horse can see that there is a woman sitting on a chair holding a baby. Except the woman is covered, hidden, in order to focus the image on the baby. It seems completely and utterly bizarre to our modern eyes. And yet, many of us do something just as crazy. You see, there is a modern phenomena called the absent mother. How many photos did you take of your children last year? Dozens? Hundreds? Can't even count them? Last year I read an article that resonated with me - it was written by a woman, a mother, who typically always found reasons not to be in photos taken with her children. Too fat, not dressed right, bad hair day, etc. And don't we all do it? Well maybe not all of us, but I certainly do. I always think I'll ruin any photo with my two beautiful, photogenic daughters so I prefer to stay behind the camera, but it means we have a distorted photo history of our family. When my own lovely mum passed away, I realised far too late that I had just one photo of the two of us together. One. Single. Photo. It's now framed and on my bedside cabinet, but one photo from a lifetime with her? That's not right is it? And considering she was the most influential person in my life it hardly reflects the importance she played. So I need to make sure my girls don't have the same problem. 'Scuse me while I go and do some photobombing. I know I keep banging on about it, but we've only been in this house a short while - almost 16 months to be precise - which in my book is a short time. 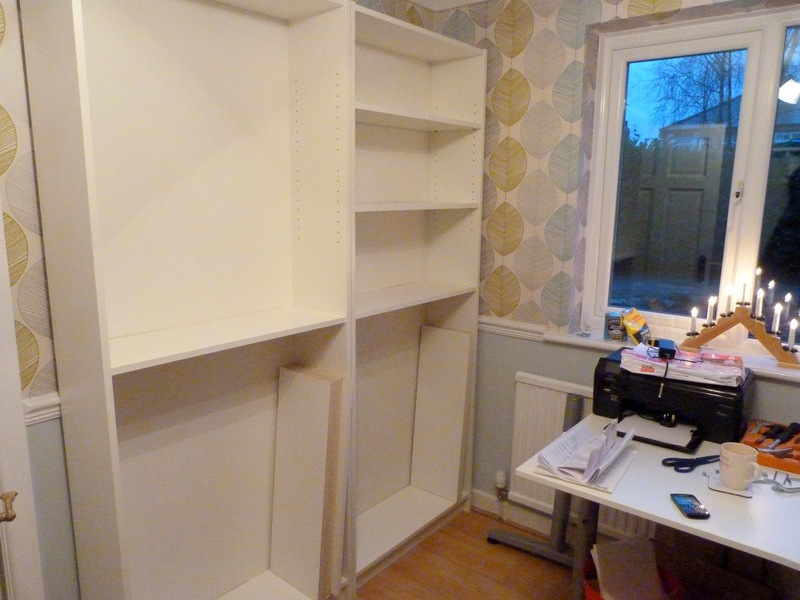 And during that time I've redecorated a few rooms - Tall Daughter's bedroom, the guest room and my study which I blogged about the other day. I also decorated my bedroom a couple of months after moving in because I couldn't live with its drabness but now it's a lovely calming room that I enjoy spending time in. I think it's the little details that a house a home, the personal touches, and today I got on with one of the smaller jobs. I'd been thinking of making a display of some decorative hearts I had been collecting and which were scattered around the house and I decided that there was a perfect spot for them in my room. I collected all the hearts and put them on the bed to try and find a suitable arrangement for hanging. I also changed some of the strings because they were a bit tatty looking and replaced them with ribbon. I put the first one in place. This central heart dictated where the others would go, although I was trying to give each side equal 'weight'. I used simple black tacks to hang them, nothing fancy. Here's the final display. I like the way it's quite random, with plenty of places for new hearts to go. The large metal heart on the bottom left hand side needs something to balance it on the other side, but I'm always on the look out for decorative hearts so I'm sure it won't be long before I find something suitable. And they're right above my favourite (in fact, my only) photograph of me with my lovely Mum. But that's another story. I'm happy with it, it makes that corner look a bit more inviting and cosy. This month's recommendations include a book with cake in the title, a film starring one of my favourite actors and a TV show with subtitles. 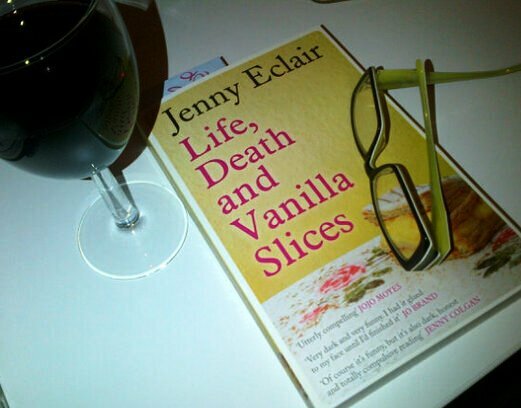 First off, the book in question is Life, Death and Vanilla Slices by comedian turned author Jenny Eclair (so in fact cake in the title and author's name!). This book was chosen at the first meeting of the new book club I joined last month. I don't read often enough but knowing I had to finish it before the next meeting motivated me to get stuck in and I read it in just a few days, which is pretty good for me. Jean and her daughter Anne have become all but strangers over the years and know very little about each others lives these days. The story of how and why is gradually revealed, and the unusual method of having each chapter from either the mother or daughter's point of view lends itself to some interesting developments for the reader. It's quite an easy read and after the first few short chapters I was hooked. It's poignant, terribly sad in places but also darkly funny and beautifully observed. Recommended. Flight is a newly released film starring the magnificent Denzel Washington as the alcohol and drug-using pilot of a doomed flight. He manages to save most people on board by employing a particularly hair-raising method of keeping the plane from plummeting to the ground, but his heroics soon give way to accusations and questions about his sobriety. We soon find out that his life is ruins because of his excesses. In my opinion Denzel Washington is always value for money in any film. He adds a natural gravitas, and in Flight he's compelling as Whip Whittaker although it's a departure from his usual heroic roles. There are also great performances from the rest of the case, specifically John Goodman as Whip's dealer and Kelly Reilly as a drug-addict trying to turn her life around. It's quite a long film (2 hours 20 mins) so be prepared. Oh, and probably not a film to watch before you go on a flight. 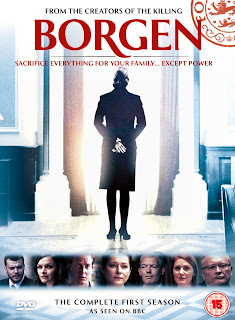 I'm a bit late to the Scandinavian TV drama but better late than never eh? 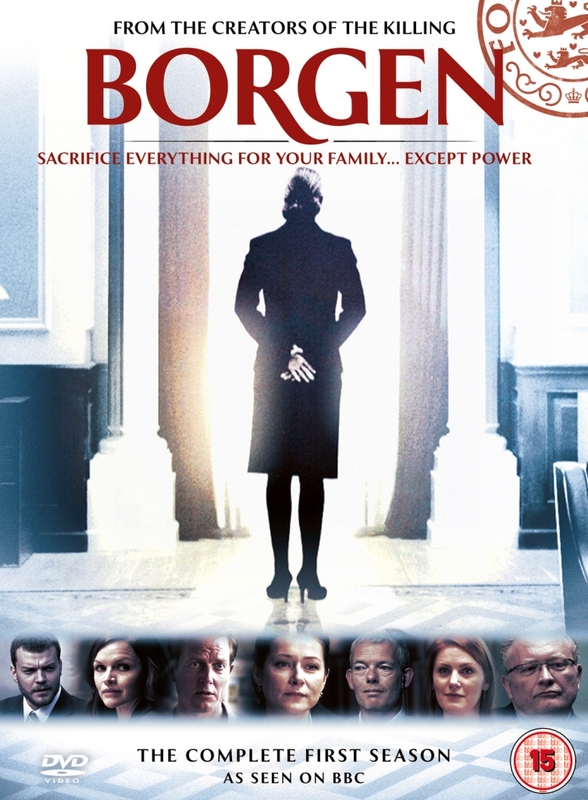 I haven't seen The Killing or The Bridge but I recently stumbled upon the Danish political drama Borgen on BBC4. It's already on series 3, and I only caught the last 6 episodes but I'm already hooked and I'm tempted to watch the first two series to try and catch up. It revolves around the Danish government, and the Prime Minister in particular. There's also her spin doctor, the other politicans and their relationship with the media and one particular news presenter who is also living with the spin doctor. Are you keeping up? Good. The mixture of personal and working relationships, and the impact of politics on both their private and professional lives is completely absorbing, although you can't take your eyes off the screen when anyone's talking lest you miss the subtitles. And the Danish language sounds so lovely! Series 3 has just ended, but watch out for its return. The snow has long gone (touch wood) but it still isn't gardening weather. It's been in turn freezing cold or raining and today it's cold and rainy. Last weekend I did manage to get a couple of hours in the garden and the main job was pruning the border at the back of the garden. I'm still an amateur at pruning and keep having to check pruning guides because I'm terrified of doing permanent damage. This is the border last year, it was really lovely but slightly overgrown. And this is what it looked like before I decided to take a machete to last weekend. Okay, a pair of secateurs but a machete would have been much more effective. At the back of the border is a humongous honeysuckle which got completely out of control last year and was growing through everything on that border. The previous owners of this house must have liked honeysuckles because there are three of them in this modest garden, and last year they were all huge. I've already cut back one of them quite drastically, and decided to do the same with this one. To the left of the photo is the flowering nutmeg which I'd already started pruning before I took the photo. And on the right is a choisya. And this is the border after a couple of hours work. It looks a bit drastic. I basically gave the choisya a haircut while still trying to keep some shape. The honeysuckle was rampant and I was tempted to remove it completely but I might see how it behaves this summer and review it next year. And the flowering nutmeg looks very stark and I was really unsure about whether I'd been too brutal but when I checked online the advice was to cut it down even more. I'm a bit nervous about that one as it was one of my favourites in the garden last year. Does anyone else have one? How do you prune it? There are also two overgrown buddleias that need to be cut right back, I'm a bit more confident with those as my ex-husband was very fond of them and we had about eight in our old garden. It's a bit of a love-hate relationship because although I like them, they remind me of happier times in the old house. I did a bit of tidying in the curved flower bed, especially around the hellebores which still had some of last years leaves, so they were tidied away exposing the beautiful flowers even more so. I'm also on a bit of a crusade to get more wildlife into the garden. Our old garden was always full of birds but this one isn't, so I've been putting out different types of bird food and have moved my bird table into a new position. It's only been in the garden since December (it was a birthday present from my ex-mother-in-law) but I think it was too near the house. I moved it nearer to the trees at the back. I hung this new wicket birdhouse on one of the smaller trees. I found this is TKMaxx on the reduced shelf so I snapped it up right away. I love the look of it, it blends in so well. I'm keeping my fingers crossed for better weather because I'm itching to get back out, there's so much to do and so many signs of growth. I never thought I'd be so enthusiastic about weeding and tidying the garden. 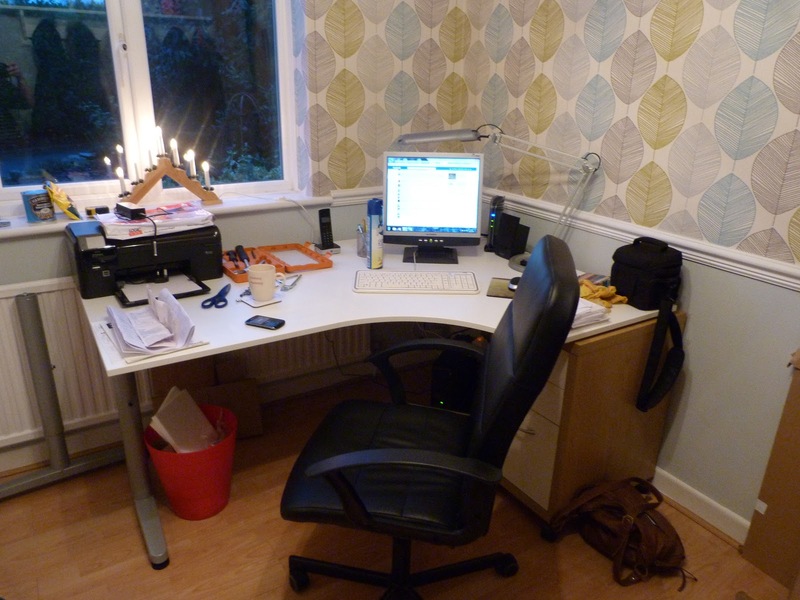 Fancy having a little nosey around my new study? I've never had a study before. It's something completely new to me, and it means I have a room just to myself. Well, that's the theory anyway. The reality is that my daughters also use it for 'homework' - you know the kind that involves uploading photos to Facebook, watching Youtube videos and listening to music. That sort of homework. 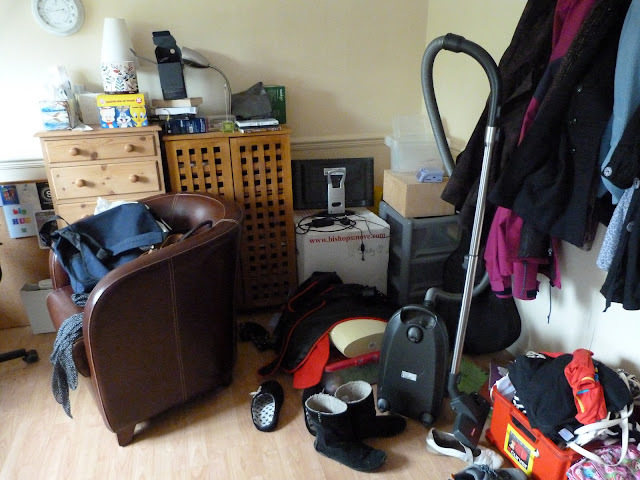 It's also where all the coats and shoes are kept too as it's the room nearest to the front door, so it's sort of a study/cloakroom too. But apart from the daughters, the shoes and the coats it's all my space! Anyway, you may remember that way back in October I outlined our plans to move the wall between the downstairs loo and my study so that the loo became a utility room. 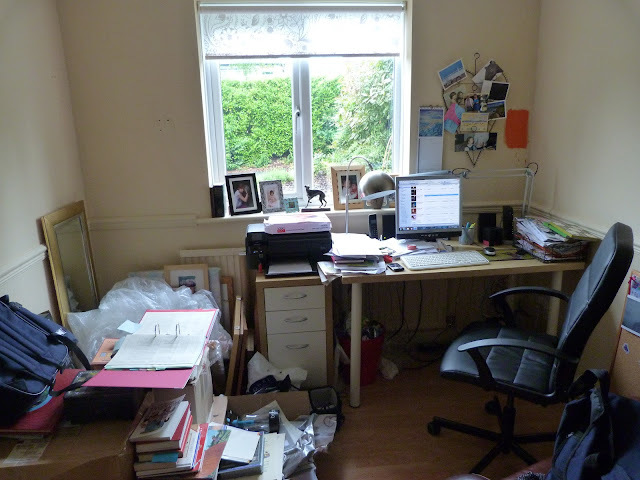 There was a bit of a delay after it had been done, but things started to move again around Christmas time when I had the study redecorated. Three days before Christmas day in fact. 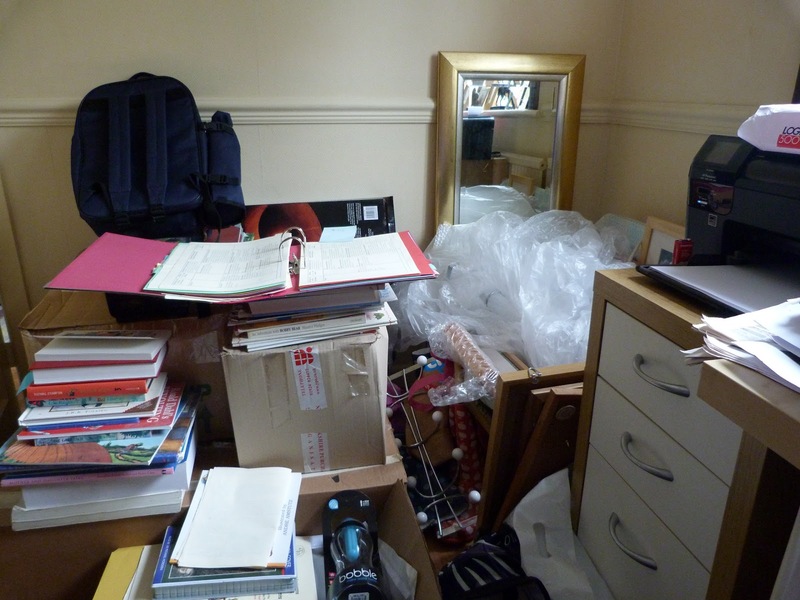 So, first of all let me show you the dumping ground that was my study before the renovations. Not very inspiring I think you'll agree, and although it doesn't show the wall colour very well on these photos I can confirm that the walls, door, woodwork, dado rail, everything was painted in the same sickly, yellowy beigey colour. In fact it was like sitting in a bowl of Heinz chicken soup, it was exactly that colour. Bleughh. Here it is just after being redecorated and with the bookshelves in place. There's a bigger desk with more space for my clutter to work, and the bookshelves have enough space for all of my books and files. Of course, because the wall was moved the room is a lot smaller - it's lost just over 3ft which takes it from a spacious 12' x 8' to a more compact 9' x 8'. It's still a decent enough size for a study though. There's still a bit of finishing off to do, because I'm great at starting projects but not as good at finishing off - especially the little bits and pieces. Once it's all finished and everything is in place I'll do a final update. The utility room is also nearly complete, and just needs a bit of tweaking which I'll do during half-term and I'll do an update of that room after that. I know it's a luxury having a study, but I do love it. I love being able to sit at my desk and look straight out onto the quiet lane we live on and being able to see what the weather's doing and when the postman is coming. It keeps the nosey side of me very happy. And when I have a cup of tea, some biscuits and the radio on it's one of my very favourite places. Do you have your own space? Where do you go when you need some space from the madness of family life? A couple of months back I wrote about how I was tired of blogging and fed up that people I knew in the real world were reading this blog. And I was. So a few blogger friends gave me some advice. Take a complete break from it all, they said. Leave it for a couple of months and then decide what you want to do. But I didn't do that. Instead I started a brand new blog and starting writing under the new name. And it felt good....for a while. A very short while. Then I started to feel something that I couldn't quite identify at first, a bit like homesickness but for this blog. Blogsickness, if you like. I had intended the new blog to me the 'new me', to be all shiny and new and positive and stuff like that. And on the whole, it was. It was a pretty blog, it IS a pretty blog with pretty photos and pretty banners. Except it didn't feel like me. To coin a northern phrase, it felt very much 'all fur coat and no knickers'. Y'know, fancy on the outside but no substance to it. Plus, the world and his wife seem to know that I write this one now so why bother starting a new one for them to find that one too. What would I do then, start a third one? Nah, I decided to come home. This blog has played a big part in my life for the past four and a half years, and I missed it. I know most people couldn't give a flying you-know-what which blog I use but I'm happy to be back. Oh, and it's nice to see you again.